A blessing for all My beloved children. I want to teach you how to pray with one another for your families, for yourselves, for your job, for everyone who is around you and for the entire world that is in a lot of danger. This way we can have a better world with tranquility and happiness, even though the world is filled with pain. Closed paths have will open. Are you ready to open your lives, your paths, your future, your happiness? Do it. Tonight, you are all chosen to come to Me, to the Angels and to Jesus, My Only Son. You all will receive protection at your home: at every door, every window, every part of the house and all thos who are living in the house will be blessed. Angels from the Throne will come into your home and protect you home from all danger and evil. Don’t let evil come close to you, My children. Today you will all be forgiven and liberated. With tears in your eyes you will be very sorry. My children, can you think about your past? What are you thinking about? Are you ready to ask for forgiveness to start a new life, so when you come to Me in heaven you are blessed and filled with miracles? My divine roses and My graces will descend from heaven directly where you are. Do you feel a great love for Me just like I feel for you? When I appear, I want you to feel how I come to you with all My love, because I love you. Is your heart beating? Do you feel my living presence? Today you are more protected than ever. Nothing and nothing will happen to you, because I am with you today, tomorrow and forever. Let the Holy Spirit blow on you and fill you with hope, light and joy. Even though life is hard and war will come, today I want to protect you for what is coming and for the danger that is on its way. Today you want to plead, you want to ask for blessings and forgiveness. You want to feel the grace, the light, the hope, even though you are tired, and you have a lot on your minds, but you did your efforts to come to Me anyhow. Can you think about someone with an illness, pray for him. If you feel like some is your enemy, pray for him and love him. If the enemy has tired you and hurt you, pray for him, even though it’s hard, you have to do it, because you are all on a great test, My children. When you pray for him you present will receive a lot of strength, a lot of miracles and lot of trust for the path of the key of life, which will turn by the truth to show you the love and the hope, which will never end. Rise and go on with your struggle and your faith. Do you love your family? Answer Me. Are you calm in your homes? Answer Me. If you have pain in your homes and with yourselves, today, what is bothering you will leave you with the power of the Holy Spirit. Thank you to Holy Spirit. Today it’s the greatest, most marvelous and kindest day. I know that you are burdened. That is why you should surrender all your burdens to Me so you can remain free, filled with love, Victory and forgiveness. Thank you for listening to My message. 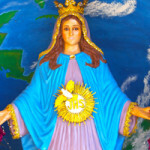 Your Mother who loves you forever, the Virgin of Grace of Aruba.